Over the Summer I got access to some really cool events thanks to Daniel Dennehy, a super talented freestyle footballer I bumped into in NYC (he also grew up in the town next to me in Dublin). Daniel was hosting a football event for Adidas with Juventus FC, and performing at an FC Barcelona world-record attempt event. He invited me along to shoot some photos of him at these events and got me a photo pass for them in the process. 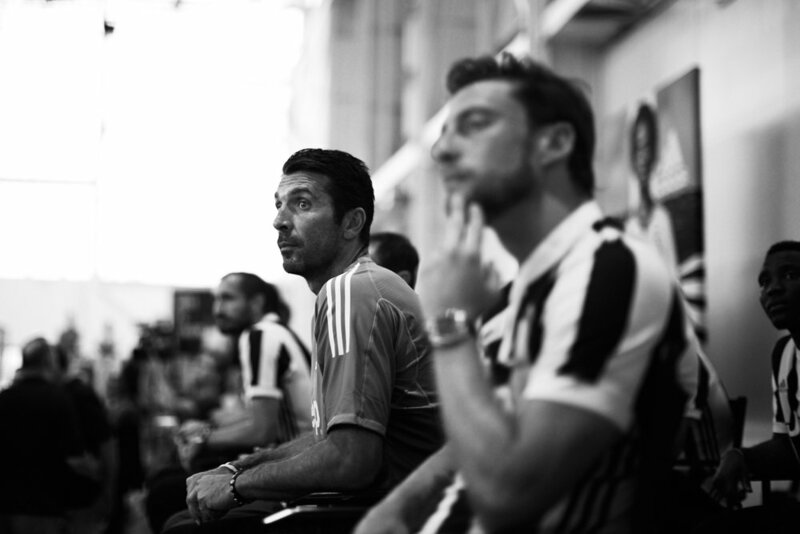 The first event was the Adidas Tango League tournament in Brooklyn Navy Yards. Juventus were in New York for a friendly with FC Barcelona, and were due to stop by the tournament to present the winning team with their trophy. The pass that I was given, gave me full access to the event and team, and with no client or shotlist to please, I was free to shoot what ever I wanted. I set myself the goal of shooting a portrait of Gianluigi Buffon, the legendary Italian and Juventus goalkeeper, and just as Juventus were leaving the event and heading back to their bus, I managed to grab Buffon's attention for a few seconds to snap 3 frames. The second event was a world record attempt for FC Barcelona fans to create the 'largest human jersey'. Daniel was doing a freestyle show at the event, which took place in Bryant Park and over 4000 fans took part. Among the crowd was Arsenal and Barcelona legend, Thierry Henry. I really wanted to shoot a portrait of Henry but the amount of people at the event and the short amount of time he was there for made that impossible. The closest I managed to get was a few feet away from Thierry amongst a pool of photographers, however he seemed to find some solitude in my lens as he stared into it for a couple of frames. The man himself who made these shots possible. Thanks again for inviting me along! !